The house in East Boothbay. Life has been busy, busy, busy lately. Hence the lack of posts here. My book draft is now in the hands of the team at Popular Woodworking Books, with some 1400 captioned photos. My shop time has been occupied teaching individual classes. That's produced good material for some upcoming technique blog posts. I've started reading through my stack of boatbuilding books. That'll take a while, but Greg Rossel's excellent Building Small Boats has been a great first step, detailing the sequence of operations. The next step in the journey is the other big thing occupying my time, a place to build boats. That place is in East Boothbay, Maine, where my mother-in-law has now bought a house. She'll live there in the warm months, then with us in the cold months. Meanwhile, we'll spend weekends and vacations there. Eventually, we'll retire there permanently. The two main criteria for the house were that it be near water, and that it have a space for my woodworking, specifically large enough for small boatbuilding. We had previously owned a house near the Damariscotta River in Boothbay, Maine, so we were familiar with East Boothbay. That was our general search region. It's spectacularly beautiful, as you can see from this image search. The house she bought meets the criteria wonderfully. 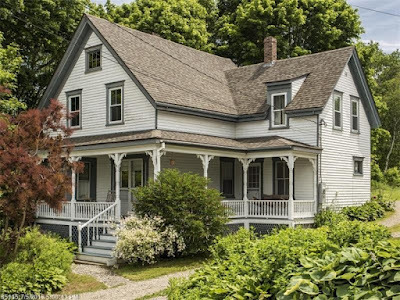 Built in the mid-to-late 1800's, it sits directly across the street from the historic shipyard waterfront of East Boothbay, on the bend of the Damariscotta a couple miles upriver from open ocean. They've been building ships and boats there since the 1700's. Two small yards are still active, Hodgdon Yachts, America's oldest boat builder, building high-end sailing and motor yachts, and Washburn & Doughty, building commercial tugs and fireboats. Hodgdon Yachts is on the site of the former Goudy and Stevens yard, where Louis Sauzedde (www.TipsFromAShipwright.com) worked on the replica of the yacht America as a teenager in the late '60's. In between those yards is a public boat ramp and a separate kayak ramp. There's another public boat onto Linekin Bay less than a mile away. Ocean Point Marina, where we used to keep our old boat, is 50 yards upriver, on the other side of the mouth to the tidal millpond. So near water, check. About 100 yards from house to ramp. The river is visible past the Washburn & Doughty buildings. Their launchings are always an event. The workspace is behind the house, a small barn with loft and one-car garage. It's perfect. There's a big sliding door in the wall that opens to an ideal spot for a small boat construction frame, leaving plenty of space on the side for workbenches and general woodworking. The loft upstairs is perfect for, well, lofting! And sailmaking. Rear view of the house showing the barn. At some point this will become Close Grain North, where I'll teach private classes in hand tool woodworking, violin-making, and boatbuilding. Of course, I have to learn how to do those latter two myself first. See one, do one, teach one. There are many other small boatbuilders in the area, as well as riggers and sailmakers. The shop of Nathaniel Wilson, master sailmaker, whose work graces the USS Constitution, among many other historic ships, is a couple houses upriver from the marina. That's only a quarter mile walk from the house. 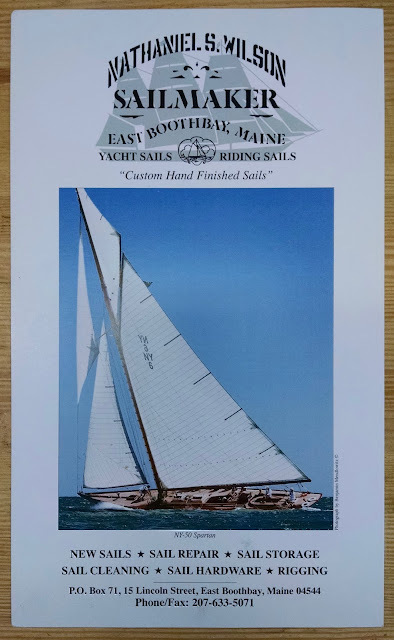 I picked up this great poster for Nathaniel Wilson at the Maine Boatbuilders Show in Portland in March. The whole area is just steeped in it, with 300 years of history. I even met a lady who's a former instructor at the WoodenBoat School and staff editor at WoodenBoat Magazine. For an aspiring boatbuilder, you couldn't ask for anything more. I continue to learn about other schools in the area. In Bristol, on the other side of the river, there's the Carpenter's Boat Shop. Then just down the road from that there's the Maine Coast Craft School. The latter school is particularly interesting because founders Kenneth and Angela Kortemeier have taken over the torch from Drew and Louise Langsner's Country Workshops in North Carolina now that they have retired. Kenneth was an intern at Country Workshops in the 90's (Peter Follansbee is another Country Workshops alum). 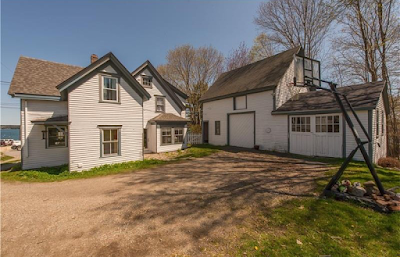 When we first found the house, I was curious about the history of the barn. I was aware of the long history of boat and shipbuilding in the area, so I wondered if it might have been used as a workshop by someone building small workboats for the bigger ships. I contacted the Boothbay Region Historical Society, and over the course of a few emails, historian Barbara Rumsey very graciously gave me some information. The real-estate listing said the house was from the 1880's, but based on tax records, she felt it could have been built in the late 1860's. She also felt the barn was probably a small livestock barn, since it was common at the time for families to have a few animals. I visited the Society, where Barbara showed me how to go through their copies of the old tax collector's books. That was fascinating. The book for each year was a hand-written account of every resident and their taxable property, roughly alphabetical by last name. People were taxed on their land, buildings, and various types of livestock. There was even a heading for musical instruments over $15 (a significant sum in the 1880's). Anyone who had an ox was very popular; they were like the guy with a truck you could hire to help haul stuff. What she had found was that the house's street address appeared in the book for 1882, listed under the name Alvin Goudy and occupied by his mother. That gave me a starting point. Working back through earlier records, I found Alvin Goudy's name first listed for that location in 1867. Working forward to see if taxes increased due to property improvements (for instance, adding the barn), there didn't appear to a major change. So it's possible the house and barn have been there since 1867. What I wasn't able to determine was what Alvin did for a living. Presumably he was of the same Goudys as Goudy & Stevens shipyard. Lacking any other evidence, it seems likely the barn was indeed used for livestock. After we closed on the house, I stopped by the Society again to say hi, and found Barbara talking to another gentleman. She said he was one of my neighbors in East Boothbay, Nat Wilson. I said, "The sailmaker!" Indeed it was. I told him sailmaking was another thing I needed to learn, and I would love to visit his shop. He invited me to stop by any time. The mind boggles. What more could an aspiring boatbuilder ask? Since building even a small boat is 100 to 200 hours of work, it'll be a year or two at hobbyist pace before I have something ready to put in the water. In the meantime, I'm happy to enjoy some rotomolded plastic fun. 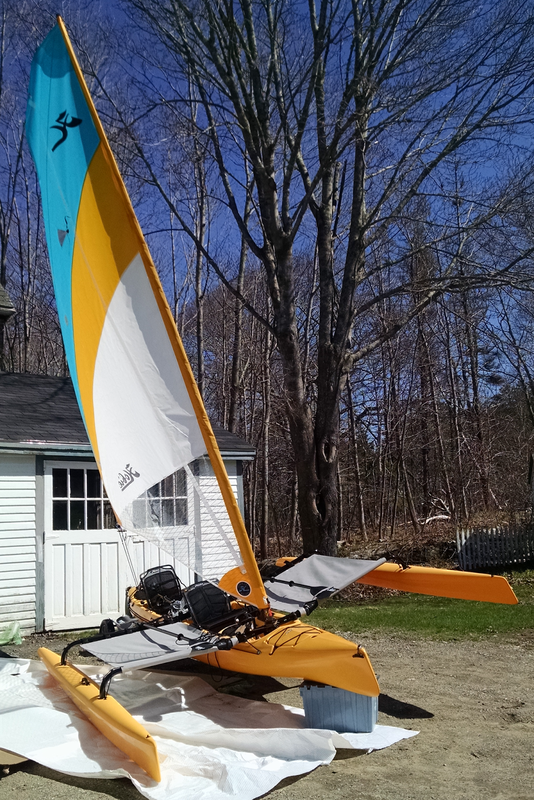 So under the heading of YOLO, I bought a Hobie Tandem Island, which is an amazing trimaran sit-on-top tandem sailing sea kayak. It has pedal-powered Mirage drives. The pedals power fins that move sideways, inspired by penguin fins; they're even reversible so you can backup as well as go forwards. You can paddle, pedal, or sail! This thing is a marvel of mechanical engineering. The modular assemblies go together quickly and easily for use, and detach just as easily for breakdown. As a tandem, it's large, 18' long; as a trimaran, it's heavy, 240 lbs. fully rigged. But those outriggers (called "amas") make it incredibly stable, able to handle any kind of conditions, even out to open ocean. That's perfect for the Maine coastal river estuaries. It has molded-in fishing rod holders, and Hobie says it's even suitable for bluewater trolling. I've never been a fisherman, but this I can get behind! 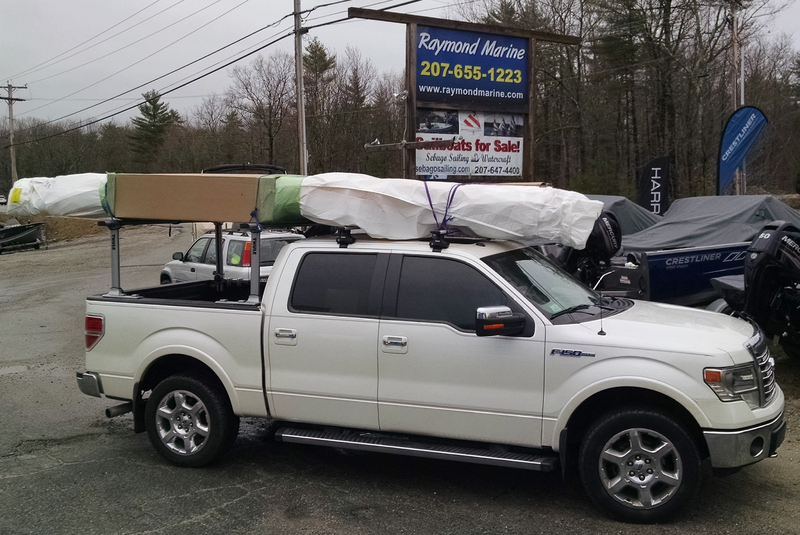 We spent a small fortune on Thule pickup truck bed and roof racks to transport the boat from Sebago Sailing And Watercraft in Raymond, ME. 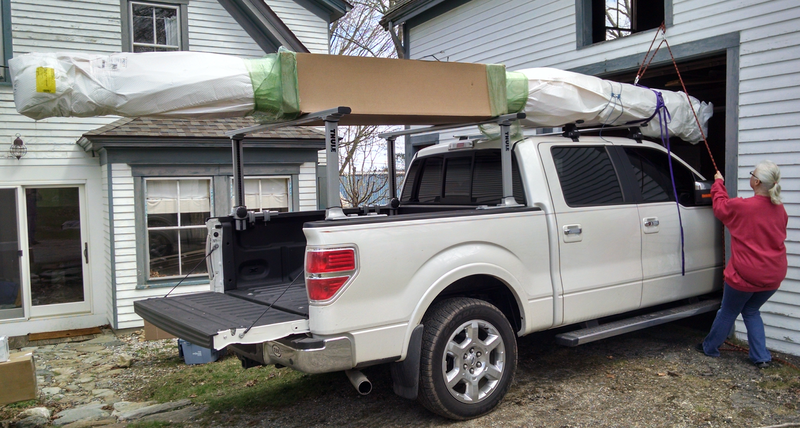 But with a boat that long, I wanted a good secure support to avoid damaging it or the truck. And now we have a very versatile hauling setup. The boat was in two packages. The main hull was wrapped in a long bubblewrap bag. The amas and all other parts were in a cardboard box about 14' long. Both fit side by side on the racks. Captain Mike, a tall fellow (who also has a timberframing business), helped us load it up. His wife Maura had been my contact for buying it. The boat loaded on my wife's F150 pickup truck. Mounted to the bed is a Thule XSporter Pro rack. On the roof is a pair of Thule AeroBlade bars. I secured the packages to the racks with 25' lengths of half-inch climbing webbing fore and aft. 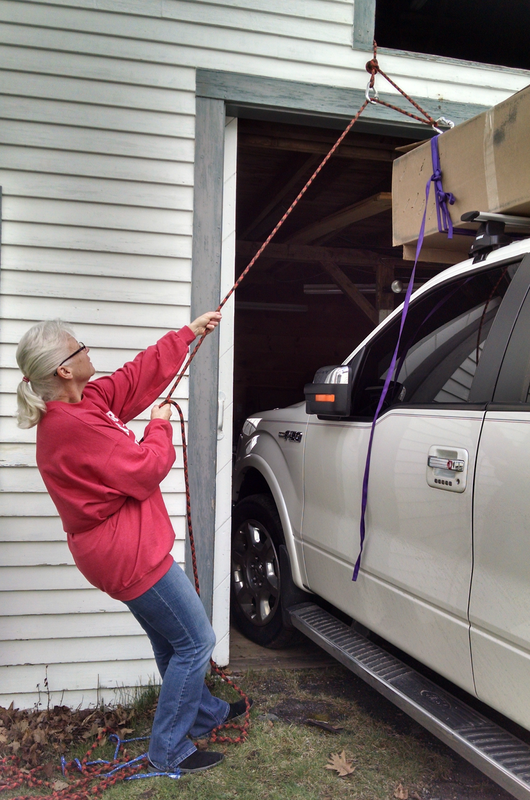 To unload the boat on our own, I used a retired climbing rope and a pair of carabiners to rig a 2-to-1 haul system from the upper door of the barn. My wife, Cat, belayed the rope to sway the front end of the box down off the rack while I stood on my toes and lifted off the other end. That allowed her to lower away easily. Then we repeated that with the main hull. I unpackaged everything and laid it out, then followed the instructions on assembly. It didn't take long. The boat is made to break down for transport with minimum fuss. I had also bought a heavy-duty two-wheel dolly that included a cradle for the amas. The boat fully assembled with sail unfurled. You've heard of sailing on the mooring? This is sailing on the driveway. This boat also takes a spinnaker. That'll be next year after we've spent some time buzzing up and down the river and out the mouth. Neat, the whole post is neat! FWIW census records from 1870 listed what my great grand father did for a living. Thanks! I'll have to look into census records. Wonderful post, Steve. Now I fully understand why we won't be hosting you this summer. We'll certainly miss you and Cat! Your blog is wonderful, new Hobie looks like so much fun. Thank you! We'll miss staying with you and John as well! I haven't had a chance to get the boat out on the water yet due to bad weather, but it sure looks like a blast.